Green Baby Care: Cloth vs Disposable Diapers, Which Is Better? Cloth vs disposable diapers: The great debate that has parents and experts weighing in ever since modern time gave us the gift of disposable diaper. But is one really better for baby and the environment than the other? Many parents are unsure of how to proceed. Should they worry about potential chemicals in disposable diapers? And which type of diaper keeps Junior drier and less prone to diaper rash? A common misperception about cloth diapers is that they are not just difficult to use, but also take a lot of maintenance. However, modern cloth diapers are equally easy to change as a disposable. Not to mention how easy it is to throw them in the washing machine to clean them up. With adjustable sizing, hook and loop or snap closures, and one or two piece designs, cloth diapers have come a really long way. No need to worry about the many folds and pins that inconvenienced parents in the days of old. Modern cloth diapers are convenient, versatile, and quite proficient at containing messes. Their adjustable fit and stronger elastic at the legs and back do a really good job. Cloth diapers offer a certain degree of convenience that disposables simply can’t. For one, you never have to run to the store in the middle of the night for an emergency restocking. Washing diapers does, however, adds about two or three loads of laundry per week, so the debate on the point of convenience becomes more of a personal preference than anything else. Parents who are big fans of cloth diapers have a lower risk of running out of diapers. They also don’t worry about a trash can overflowing with non-biodegradable waste. They do, however, have to remember to throw them into the cold rinse cycle (along with cloth wipes and washable diaper pail liners). For some, it’s easier to do a load of laundry than having to get in the car, put baby into the car seat, and paying up for a new batch of disposable diapers (more about the costs below). So cloth diapers need a rinse, wash, and dry and they can be used hundreds of times. What’s Best for Baby’s Skin? Many cloth diapering parents have sworn off disposables because of the exposure to chemicals associated with their manufacturing. Dioxin is a chemical used in the production of disposable diapers, and while it’s a known carcinogen, no research has shown an association between wearing disposable diapers and skin sensitivities. However, families who are concerned with the connection between gases from disposable diapers a potential increase in asthmatic symptoms choose cloth diapers. It also helps parents to reduce overall exposure to chemicals in the family environment and offers them peace of mind. There’s no denying that disposable diapers are amazingly good at keeping skin dry due to their high absorbency. However, many parents think that because they are super absorbent, they don’t have to change the baby’s diapers so often. Research shows that parents tend to change disposables less frequently than every 2-3 hours, which is the doctors’ recommendation. Worth mentioning is that sales of diaper rash creams soared at the same time as sales in disposable diapers dropped, bringing fresh attention to the disposable diapering dilemma. As far as cloth diapers are concerned, the cost per change is less important given that you can use each cloth diaper hundreds of time. Therefore, parents are encouraged to change the diaper more frequent and keep the baby’s skin truly dry and rash free. No less than 20 billion diapers end up in the landfills every year in the United States. But before they are thrown away, they leave a staggering footprint on our planet through production, distribution, and disposal. The average disposable diaper can take up to 500 years to decompose in a landfill. They also contain wood pulp, petroleum, perfumes, plastics, and dioxins – all of which should concern the eco-conscious parents. When a couple chooses cloth diapers instead of disposables, they eliminate approximately 6,000 diapers per child from U.S. landfills. They also help the environment by eliminating the greenhouse gases associated with the production, transportation and distribution of disposable products. On the other hand, washing and drying cloth diapers require large amounts of electricity and water. Plus, trucks delivering commercial diaper services consume fuel and add to air pollution. The American Academy of Pediatrics takes no position in the debate, nor does the Environmental Protection Agency (EPA). Ultimately, parents, you are left to make this decision on your own. Which Diaper Keeps Diaper Rash at Bay? Several causes are responsible for diaper rash, including friction, moisture, urine, and feces. Unsurprisingly, there’s also no consensus when it comes which type of diaper is best at reducing the risk of diaper rash. 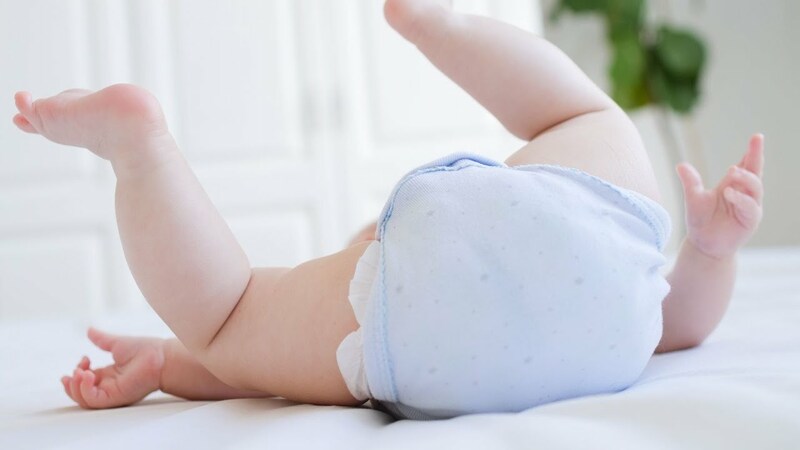 However, Tanya Remer Altmann, MD, FAAP, claims that most pediatricians recommend disposable diapers when it comes to preventing irritation diaper rashes. Remember their super absorbency? That often keeps the baby’s bottom drier and less prone to rash. But that’s not to say that parents who use cloth diapers can’t cut risk. All the need to do is minimize the amount of time that the baby’s bottom is in contact with moisture (urine and/or feces). If you’re fine with changing the baby’s diaper very frequently, cloth diapers can be as good at rash prevention as disposables. Last but not least, cost is an important factor in the cloth vs disposable diapers dilemma. Evidently, cloth diapers are significantly less expensive than disposables. Use generic disposables for over 2.5 years costs around $1,400. If you’re choosing premium earth-friendly options, the cost can go up to $2,500. On the other hand, a full-time cloth diapering system can cost you as little as $300. Cloth diapers have an upfront cost when you build up your supply, but it balances out the recurrent stress of budgeting for disposable products over and over again. Therefore, choosing cloth diapers is cheaper overall.